You are here: Home / For Clients / Spring Cleaning Giveaway! 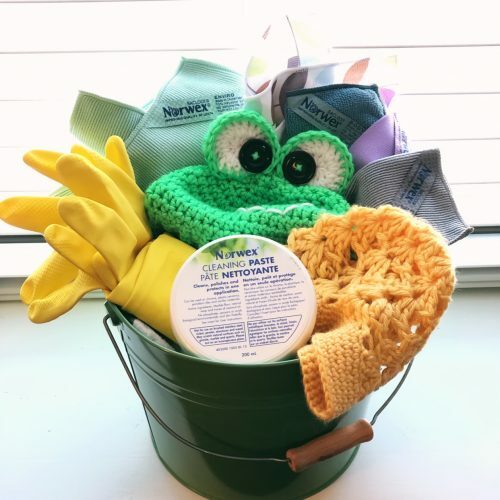 For our spring giveaway, we thought some cleaning supplies would be fun. 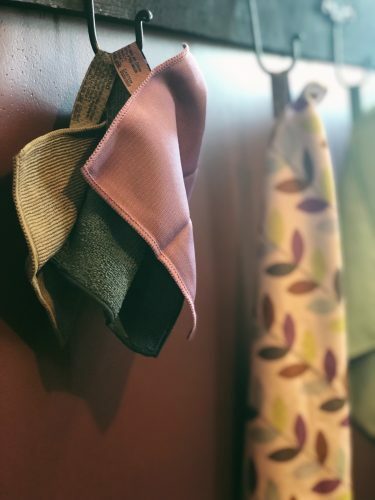 The Window Cloth is a silky, tightly woven microfiber cloth that will leave your windows streak-free. This particular Window Cloth has a really sweet floral pattern that has since been discontinued. This set of three clothes is a sample bundle of sorts. 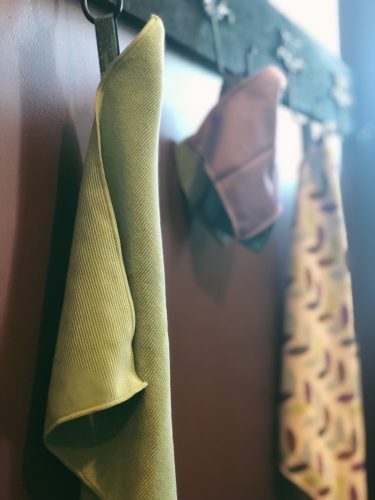 It includes miniature (6.3″ x 6.3″) versions of the EnviroCloth, Window Cloth, and Body Cloth with BacLock. This little kit is perfect to keep stashed around the house, in the car, or to toss in your bag! 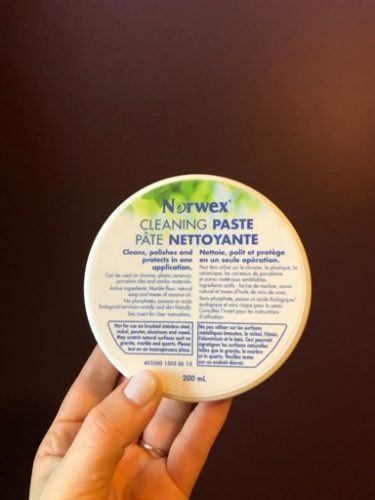 Use this paste with a damp EnviroCloth to clean chrome, stainless steel, porcelain, glasses, and most food-ware products. It will remove burned-on gunk, get rid of stickiness, and a lot more! 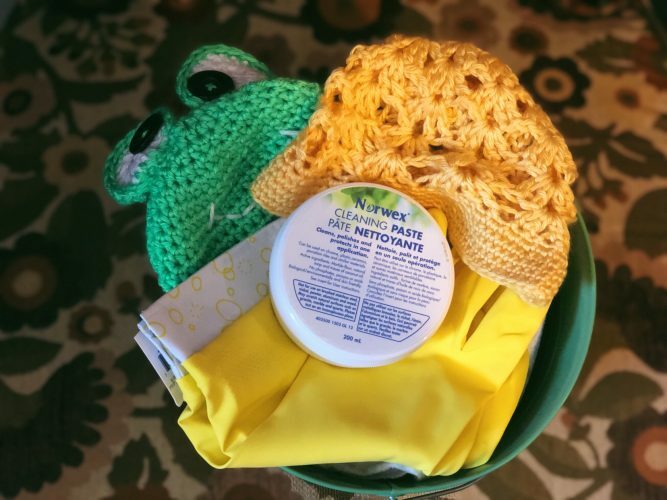 The remaining items are a green cleaning pail, some cheery yellow rubber gloves, and your choice of a crocheted froggy hat, or yellow lacy hat. The hats are handmade by a local mama, Bundle of Yarn. There are 3 platforms to enter this giveaway, each platform has a few steps. All steps must be followed, entering on multiple platforms increases your chances of winning (3 possible entries, one each for Facebook, Blog, and Instagram). Must be 18 years of age, pail is included for local winners, remaining items can be mailed to an address in the contiguous US. Entries will be accepted until 11:59 pm on April 1, 2019 and the winner will be announced April 2, 2019. Good luck! 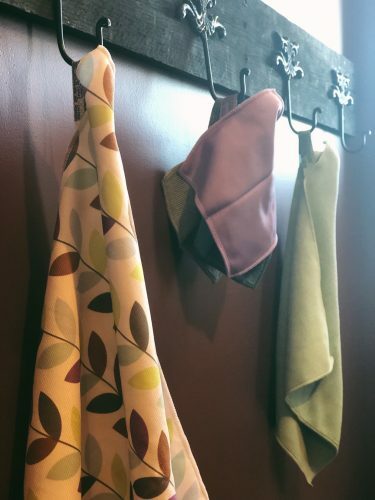 Special thanks to Sara for donating the lovely Norwex products, we know they will be well-loved. Visit her here to order your Norwex products. I need to Spring Clean our sunroom and get outdoor toys/shoes in order. I don’t see the Instagram giveaway post! Abbi, you’re right! Instagram was being difficult, but it’s posted now. I need to spring clean the new nursery. Right now it is a storage space, and it needs to be cleaned up before the baby arrives. I need to Spring clean my entire house!! I need to spring clean my house! My basement storage is the current area under siege. I need to spring clean all the shelves and dusty corners especially! !